Lee Murphy, a passionate and knowledgeable jam master and owner of Vista D'oro Farms & Winery, presents a vibrant look at the pleasures of creating and using beautiful, seasonal preserves. A short drive from Vancouver, and an even easier trip over the border from Washington, The Preservatory is located on the bucolic ten-acre farm and winery in South Langley, British Columbia, Canada, and is home to a growing international brand where the star of the show is the in-season, locally grown fruit. 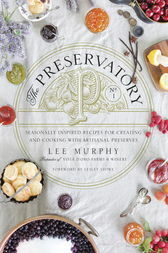 At the Preservatory, Lee Murphy and her team create delicious artisanal preserves in small batches using copper pots for locals and visitors alike.